Known and highly praised from ancient times; a rock consisting predominantly of lazurite [haüyne] (25—40%), calcite, pyrite and other minerals. 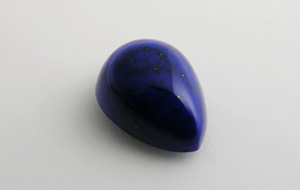 The name is derived from the Latin for ‘stone’ and the Persian for ‘blue’. Historically comes from the mines near Sar-e Sang, Badakhshan Province, Afghanistan.